Our address is: 7 Station Road Orpington Kent BR6 0RZ. You will find the Club near the War Memorial Roundabout, up Station Road, opposite Tesco. There is limited parking outside. Orpington is just 30 minutes by train from London Charing Cross, and 5 minutes’ walk down Station Road from Orpington railway station. If arriving by road, we are a few minutes’ drive from Junction 4 on the M25. 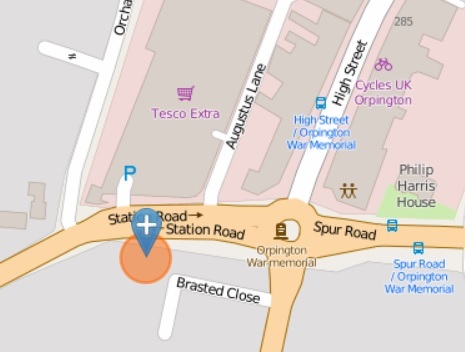 Follow the A224 to Orpington and turn left at Spur Road, continue over the War Memorial Roundabout and we are just on the left a little way up Station Road. Bus Routes: B14, R1, R2, R3, R4, R5, R6, R7, R8, R9, R10, R11, 51, 61, 208, 358, 477 and N47. My wife and I (both CAMRA members) would like to visit the club early on Friday evening, with two others. We are not members – is that OK? No problem. CAMRA members are very welcome. We look forward to seeing you. Hi our band play pubs in Bexleyheath Crayford Barnehurst Sidcup Belvedere Blackfen Lee Green Croydon Carshalton Biggin Hill and Keston.We play most of these regularly.We are always keen on playing new venues and although mostly booked for the year we have some dates in the second part of the year.If you are interested or need to know more please contact me.I can give the names of the pubs we play if required.Many thanks.Hope to hear from you. Colin, [ Ashtones Band ]. Hi was in touch recently in June I think about our band the Ashtones.I seem to remember getting a reply saying someone would be in touch.Just wondered if you have any comments about my earlier message.Many thanks. Colin. [ Ashtones Band ]. I did pass your message on to the club booking secretary. I’ll give him a nudge. I’ve passed your message and details onto Peter Muldoon. Hopefully he will be in touch soon. I am keen to book two tickets for the Spinners Mick Groves, Hughie Jones and Count John McCormack in September. Can you email me booking details please?